This HomCom's Sit and Stand Computer Riser offers a perfect solution for you to improve your health, energy and productivity. Recent studies have shown the great benefits of periodicly standing throughout your workday at the desk instead of sitting at your computer all day! With this gadget, you can easily and quickly switch from sitting at your desk to standing within seconds. The durable and large work surface enables you to put dual monitors and heightens productivity. Easy raise and lower, no assembly required! - Sit and stand with the comfortable heights from 6.5"-16.3"
✔ HEALTHY ALTERNATIVE: Proven to help improve health, energy, and productivity by allowing you to switch between sitting and standing throughout the day. 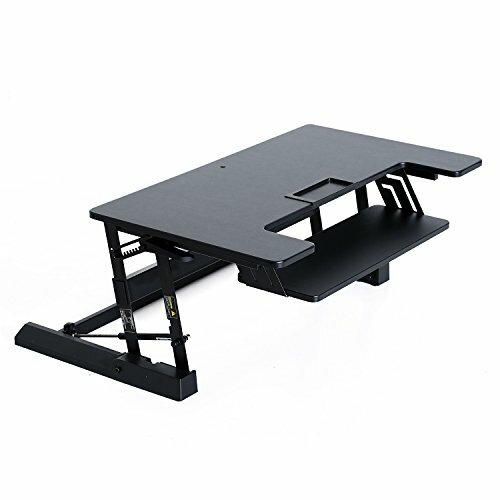 ✔ STABLE DURABILITY: Sturdy steel frame and MDF topper can support up to 33lbs and hold 2 monitors or a Monitor and a Laptop easily and conveniently. ✔ HEIGHT ADJUSTABLE: Transition between sitting and standing with the push of a button as your rise adjusts up to 16✔for a standing option. ✔ CONVENIENT KEYBOARD SHELF: Staggered height between the keyboard shelf and monitor stands prevents neck strain and wrist strain. ✔ EASY MAINTENANCE: The steel frame and textured MDF are easy to clean with a wet cloth and require no maintenance.